A file photo of the aerial view of Long Lama town. 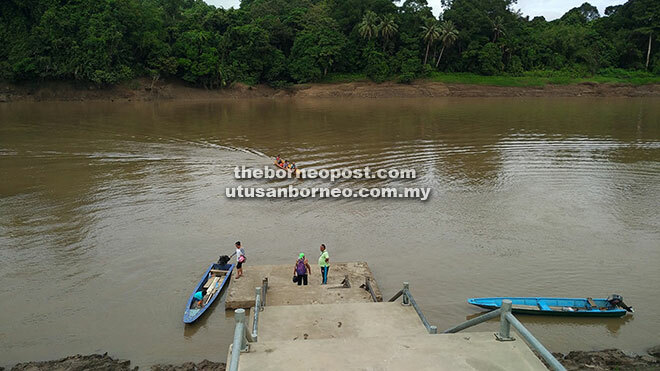 MARUDI: In the middle of the great Baram River, Sarawak’s second longest river, lies the solitary town of Long Lama, where people live a plain and simple life. 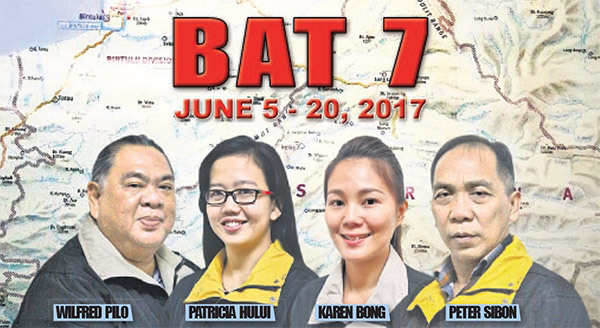 Off the beaten track, BAT7 made it to this tiny town about 143 km from Miri, which has a population of about 1,500, hidden within the Kayan territory in the northern interior of Sarawak. Founded by the Kayans, the town got its name from the Lama River that winds around and eventually joins with the Baram River. ‘Long’ in Kayan means river while Lama means old. So Long Lama means an old river. Wan Anyie at the Long Lama District Office. BAT7 met up with former and the only journalist here from See Hua Daily News, Lai Khee Piang, 72, who was kind enough to show us around and share his experience, having lived here for 40 years. 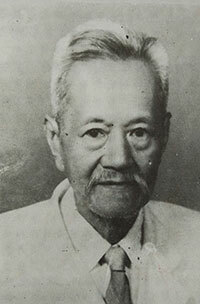 Lee Kai Tai was the first Chinese Hokkien to settle in Long Lama. In 1910, Lee Kai Tai and two friends were the first Chinese Hokkien from China to set foot and trade in this town. 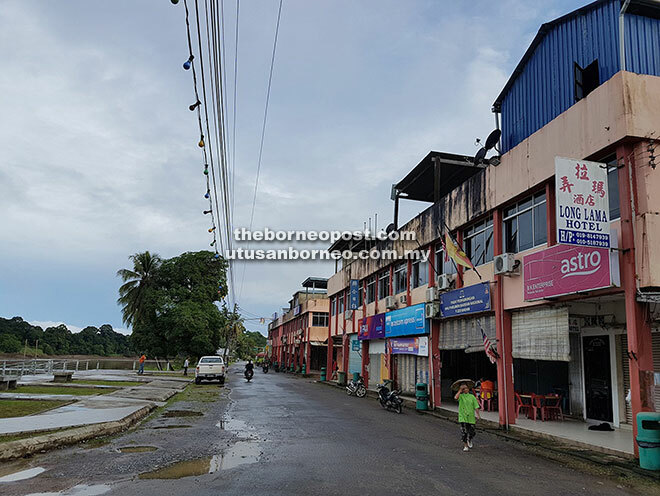 “They cooperated to build five shop houses for commercial activities situated at the riverbank near the Kayan longhouse opposite the present town,” Lai related. “Later, the shop houses were relocated and expanded across the river to the present town until today – from wooden structure to concrete buildings in a span of a century,” he said. In the early days, Lai, who is from Marudi, said only a few Chinese dared and were willing to migrate here to carry out farming and trading due to tribal conflicts and headhunting. Today, there are 26 shop houses running various businesses including groceries, coffee shop operation and selling of other basic necessities as well as four hotels. “Water supply came in 1976, electricity supply was connected in 1986 and cable telephone was connected in 1990s,” he shared. 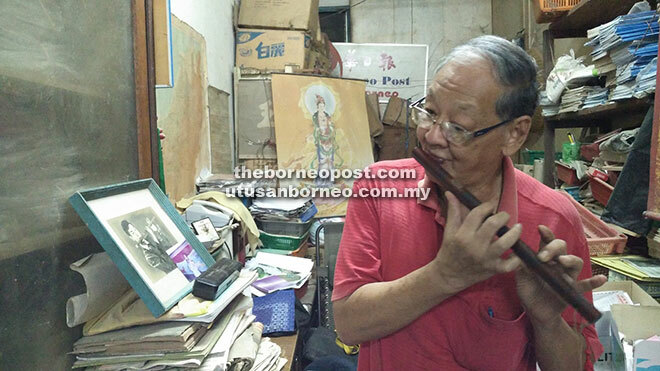 Working as a journalist in the early days was challenging, Lai said: “If there was any interesting news, I had to radio call to connect to the Miri or Sibu office. The Baram River was and continues to be the lifeline of the community, particularly the numerous tribes living in the isolated interior. “Ferry service started in 2002 and boat is used to transport goods and people along the river. 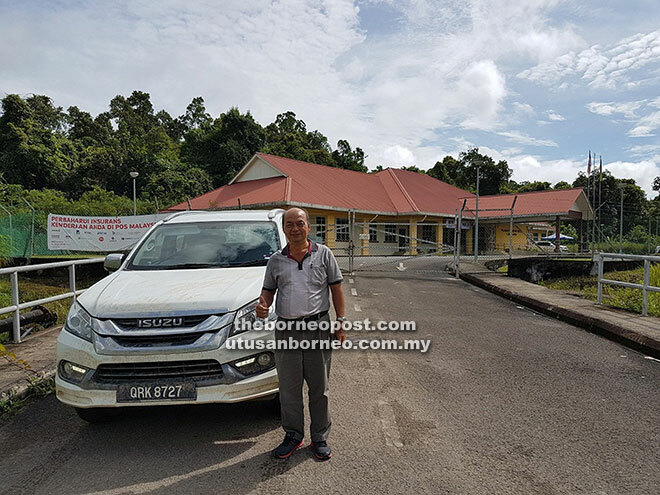 In the early days, sending a black and white photograph to See Hua office in Sibu could take up to three days by boat, from here to Marudi to Miri then Sibu,” he added. Lai playing the flute in his crowded shop filled with all kinds of supplies. Lai, who owns a stationery shop in this town, had contributed immensely to the community over the years since moving here – serving as a councillor, then as chairman of the school board. “Before I moved here, I was a photographer and a musician working in Kuching,” he said of his interesting and colourful younger days. Playing the Chinese flute and harmonica well, he played a couple of songs to entertain us at his dimly lit shop filled with all kinds of stationeries, gifts and other supplies. The Long Lama town with several rows of shop houses running various businesses like groceries, coffee shop operation and other supplies. That just depicted the slow-paced life in Long Lama, just plain and simple because there are no social infrastructure and activities while economic activities are limited. The people just walk around town and the uninteresting waterfront which serves as the pier where boats dock, or hang out at the several coffee shops, eating and drinking with loud old Chinese music played through the radio. “Life is harder now due to the economic downturn and the indigenous people are struggling so it is hard for businesses and spending is less as well,” he pointed out. BAT7 also made a visit to SMK Long Lama, the only secondary school near Long Lama town. Built in 1965, the school has about 712 students from Form one to Form six and 61 teachers. The school’s compound is vibrant and has a cheerful atmosphere, thanks to rows of colourful flowers planted alongside the school’s buildings and hallways. As the saying goes ‘it takes a village to raise a child’, its Parents-Teachers Association (PTA) member Mok Chiaw Min said the Long Lama community is very active in contributing to the school’s welfare. “The parents here contributively work together with the staff and teachers to make this school as cheery as possible. “Some of the things we did were donating flowering plants to liven the school up and televisions in the dining hall for the students’ entertainment,” Mok said. People from upper Baram river going to Long Lama to trade and get supplies dock their boats at the pier of Baram River. However, according to Mok, there are more things to be done such as two blocks of the boys’ hostels and staff quarters which are slowly deteriorating. 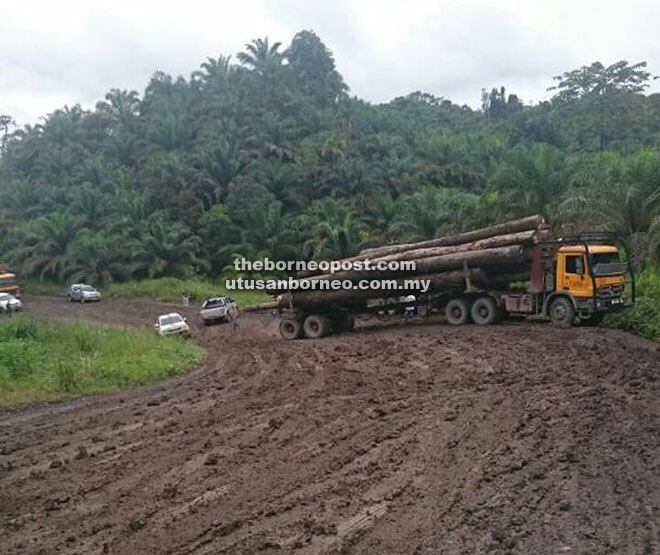 When contacted, Telang Usan assemblyman Dennis Ngau said his focus now is to upgrade as much of the abundant logging roads as possible to connect major settlements. He reckoned that at least RM3 billion is needed to construct good roads plus bridges in the whole area of Ulu Baram. “But my focus is to build a good road from Long Lama to Mulu which is at the opposite end of Mulu National Park with the distance of 160 km. The other road which I also focus on building is from Lapok to Ulu Tinjar, with the distance of 80 km. “We need these two roads urgently to promote ecotourism in Ulu Baram which we believe can attract large numbers of tourists to come, especially the Mulu National Park and to other places of natural beauties at Ulu Tinjar,” said Dennis. He also revealed that Telang Usan has been given priority by the state government to harness solar energy. Currently, at least two longhouses are using solar energy and few other villages will be getting the same source of energy soon. The locals share a logging road to move around in Baram area. 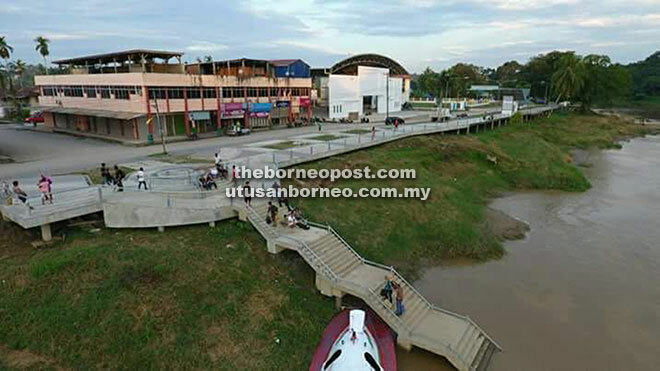 On the overall development of Telang Usan, Dennis was thankful that the Baram bridge which was approved by the late chief minister Datuk Patinggi Tan Sri Adenan Satem costing RM77 million is expected to be completed in the next two years. Supporting Dennis’s effort to bring greater connectivity to Long Lama, PBB Long Lama branch chairman Wan Anyie said since the district is so large and rich in natural resources such as timber, quarry, coal and fertile land, the people deserve better basic necessities such as water and electricity and he hoped the area will soon be well-connected with mobile phone and internet coverage which the state government plans to implement in the next few years. Thus, it is hoped that the people in upper Baram will soon enjoy a better quality of life with implementation of more communication towers in the rural areas. And finally, it is much anticipated that by 2030, Long Lama will also be like any other well-connected towns in the state.